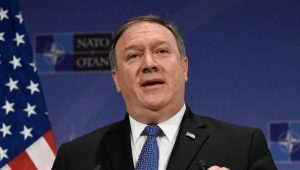 On Thursday, U.S. Secretary of State Mike Pompeo asked European leaders to support the United States in its plans to cut off the Iranian regime from the world’s energy markets, according to an AFP report. 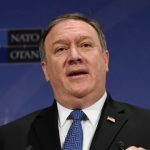 Pompeo made this request during talks in Brussels at the E.U.-U.S. Energy Council at this year’s NATO Summit. In attendance were Energy Secretary Rick Perry, Saudi foreign minister Adel Al Jubeir, Iraqi PM Haider Al Abadi, and E.U. foreign policy chief Federica Mogherini. Iran’s list of destabilizing activities includes its support of the Houthi terrorists in Yemen, its continued use of ballistic missiles, despite a U.N. resolution prohibiting the practice, its support of dictator Bashar Al Assad and his use of chemical weapons in Syria, its interference in Iraq’s elections, and its most recent terrorist plot to attack the Iranian opposition,(MEK), at their annual gathering in Paris. He attached a map of Europe to this tweet, marked with the location of the eleven known terror attacks that have been carried out by the regime or its proxy, Hezbollah since the regime took power in 1979. The United States withdrew from the Joint Congressional Plan of Action (JCPOA), otherwise known as the Iran Nuclear Deal, in May of this year, saying that the regime had repeatedly and flagrantly violated the terms of the deal. The U.S. withdrawal from the JCPOA triggered the reinstatement of sanctions against the regime, largely affecting its oil industry, which accounts for much of Iran’s revenue. The U.S. has since warned other countries to stop buying Iranian oil by November 4th or face sanctions themselves. The United States can sanction any transaction done with U.S. dollars. Almost every large transaction touches a U.S. financial institution at some point, and if it involves Iran, the United States says it will sanction that transaction. Whether the other signatories of the JCPOA comply or not might be irrelevant. The cost of doing business with terrorists will increase significantly starting on November 4th. Other signatories of the nuclear deal include France, Germany, and the U. K. These countries are all attempting to save the deal, but as of right now, there is no reason to believe they can protect themselves or their companies from U.S. sanctions.